John Pollock reviews this week's edition of NXT with Ricochet taking on Adam Cole in the main event, Undisputed Era all over the show, the top tag teams battle & more. -The main event was a strong match between Ricochet and Adam Cole. The focus centered on Cole’s attack of the left knee and became intriguing how Ricochet varied his offense to sell the knee. Often there are slips where the knee injury is forgotten, and Ricochet did better than most altering a high-flying offense to respect the story being told. One of the highlights was a one-legged springboard maneuver by Ricochet using the healthy leg and later hopping up the ropes to perform a top rope Frankensteiner. The closing sequence was led by the Frankensteiner and followed with a rolling Northern Lights suplex and his Vertigo (Cradle Shock) finisher to win the match. I liked the main event a lot and these are two of the best they have regardless of roster. -After the match, the rest of the Undisputed Era ran down to attack Ricochet. Aleister Black ran in for the save but the babyfaces were outnumbered as Undisputed Era stood tall to end the show. -The Undisputed Era has a large presence on the show, recapping their recent tag title loss and indicating their game plan to win all the NXT titles in 2019. They did a promo stating Kyle O’Reilly would go back to teaming with Bobby Fish and Roderick Strong will pursue singles gold. 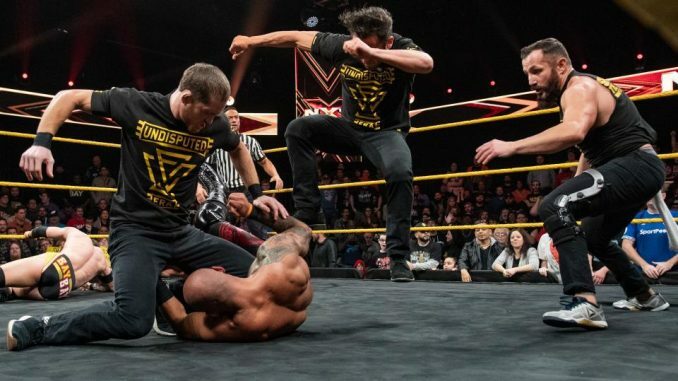 -They also got involved in a big segment involving the top tag teams with the champions the War Raiders, Oney Lorcan and Danny Burch, the Street Profits, and Fabian Aicher & Marcel Barthel. The segment concluded with the War Raiders clearing the ring. It’s a deep tag division in NXT and was one of the show’s calling cards throughout 2018. The Street Profits are starting to ascend to that next level and the time spent at EVOLVE has likely assisted. You can mix and match these five teams and there isn’t a bad combination. -Aliyah is doing a new character that dresses up in designer clothing like Versace, sort of an Instagram influencer meets NXT wrestler. She defeated Taynara Conti with her new submission, which is a kimura with heel strikes to the head causing Conti to verbally submit. She is going to draw a lot of comparisons to Carmella with the new character, but we’ll see where it evolves as this was the first time, I’d seen her in this updated presentation. They are also aligning Aliyah with Vanessa Borne. -Shayna Baszler, Jessamyn Duke, and Marina Shafir ran off Aliyah, Borne, and Conti after the match and made them feel like afterthoughts. Baszler was pinned in the six-woman tag last week, so she was pissed. She told the women to get out of their way and “don’t piss us off”, meaning Jeff Jarrett’s 1999 run is Daniel Bryan approved because it’s been recycled a lot over the past month. -The Street Profits defeated Humberto Carrillo and Stacey Ervin Jr with a super blockbuster delivered to Ervin. I was curious to watch Ervin in his television debut. As a gymnast, the athleticism he possesses is already evident and he showcased his Tsunami sault, which was an incredible looking moonsault with extraordinary height. He’s very raw but wasn’t out of place in the match and has lots of potential. Ervin and Kacy Catanzaro are going to be going to be intriguing projects to watch. I’m very high on the Street Profits, who are fantastic in their roles and Montez Ford certainly has the “breakout star” label. -Prior to the tag match, Kassius Ohno came out running down the crowd at Full Sail University for their chants and thinking they know everything. He said he is leaving NXT and then was knocked out by Keith Lee, who sang and cut a promo on the unconscious Ohno. -Dominik Dijakovic won a quick match over Shane Thorne with Feast Your Eyes. Thorne started attacking with kicks and Ranallo stated that even though Dijakovic wears the Croatian flag, it’s Thorne that is replicating Mirko Cro Cop. The funny part is that Ranallo will be calling Cro Cop’s fight this Saturday for Bellator. They seem very high on Dijakovic and he’ll be a lot of fun to watch as he works his way up to longer matches with some of the roster members. Thorne feels very lost without Nick Miller (Mikey Nicholls) and hopefully isn’t lost in the shuffle, but this roster is so deep that it’s easy to get lost. -Next week’s show will feature Johnny Gargano vs. Velveteen Dream for the North American title, which is the match they shot different endings for. -The show was worth it for the main event, but each match had a story of varying importance. It was a fast-paced show with lots of different characters woven throughout the 60 minutes. It seemed like a larger than usual amount of talent they fit onto the show between matches and speaking roles. A fine 7/10 show.